Bring them home: On February 23, 2006, Australian Scott Rush sits in the dock during his trial for drug smuggling in Denpasar on the Indonesian island of Bali. 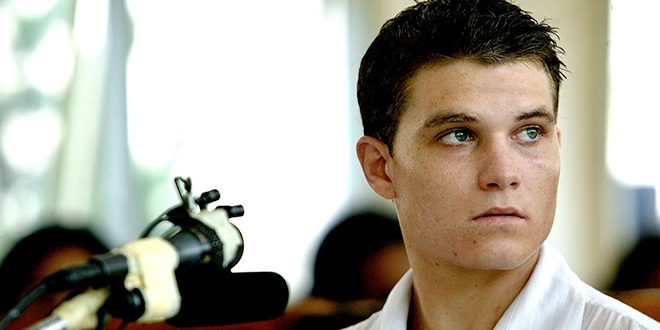 A QUEENSLAND bishop has demanded it was time to bring home the remaining Bali Nine, convicted after smuggling drugs in 2005 and still languishing behind bars in Indonesia. “Surely our government and the Indonesian government could get together and talk about the possibility of getting those Australians home,” Townsville Bishop Tim Harris, who has a deep pastoral connection with the Bali Nine, said. Bishop Harris visited Scott Rush and Michael Czugai in Bali’s Kerobokan prison in 2008 and saw the squalid conditions suffered by the young Aussie prisoners. The pair went to school in Brisbane’s Corinda-Graceville Catholic parish where Bishop Harris was the parish priest. Bishop Harris knew their families, has supported them through prayer vigils and advocated on their behalf, especially when Rush was on death row. The deportation back to Australia of Renae Lawrence this week after 14 years in Indonesian prisons means the Bali Nine is now down to five – but those who remain behind bars may never taste freedom again. “Bring these fellows home. You just hope and pray that the Indonesian government would consider that,” Bishop Harris said. “I think they’ve learnt their lesson – I’m sure Scott has, I’m sure Michael has – and to be near family and friends back in their own culture and familiar territory. Catholic lawyer Colin McDonald QC, who has spent more than a decade fighting for the release of the Bali Nine, described Renae Lawrence’s release as welcome news. He said Lawrence had been “a model prisoner”. She served nearly 14 years of a 20-year sentence. “To her credit she has earned remissions for good behaviour consistently every year and that’s why she is coming out now,” Mr McDonald said. It was in 2005 that nine young Australians made world headlines attempting to smuggle 8.3kg of heroin strapped to their bodies out of Bali’s Denpasar airport. Since then, Andrew Chan and Myuran Sukumaran were executed by firing squad in 2015, and Tan Duc Thanh Nguyen died of cancer last May. The remaining drug conspirators are still in jail – Michael Czugaj and Matthew Norman, 32, Scott Rush and Si Yi Chen, 33, and Martin Stephens, 42. Rush spent five years on death row and is now serving life. 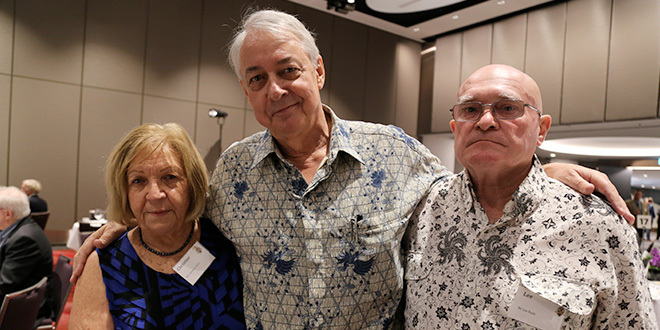 Waiting in hope: Scott Rush’s parents Lee and Christine with Colin McDonald QC (centre) at the Assembly of Catholic Professionals luncheon in Brisbane in June 2017. Last year, lawyers acting on behalf of Rush’s parents Lee and Christine Rush sought clemency for their son and this was rejected in Indonesia. It was a devastating moment for the Rush family, according to Mr McDonald, who had previously worked on Rush’s complex and delicate case and was seeking a judicial review of the Bali Nine cases. “Having taken the clemency route that legally disqualifies you from any other legal avenue including judicial review,” Mr McDonald said. Mr McDonald is not giving up the legal fight. Mr McDonald noted the awful prison conditions he had witnessed during his many visits to see Rush. “… It’s seven in a cell … no bed, no mattress, sleeping on the floor, basic meals,” he said. “Scott’s a remarkable person. He has faith, and faith is one of the things keeping him strong. Buoyed by news of Lawrence’s release, Mr McDonald will visit Czugaj next week.